You Can Have Permanently Luscious Lips! Millions of women bear the pain and expense of frequent injections for lip enlargement. While some lip fillers last more than a year, most require re-injection every six months or so. At last, we have a permanent method for lip enlargement that requires very little time, an extremely fast recovery period, and is totally reversible should you change your mind later on! Why New York Perma™Lip Patients Love their Lips! Since Perma™Lip implant material was invented in 2002 and approved by the FDA in 2007, almost 30,000 implants have been performed (15,000+ patients—some had only one lip enhanced). The procedure is performed under local anesthesia and takes less than 30 minutes from start to finish. While Perma™Lip lip augmentation is considered “permanent, “ because you don’t need repeated injections or treatments, the material can be removed or augmented, should you wish to go smaller or larger in the future. Healthy adult men and women are the most appropriate patients for Perma™Lip augmentation. Those taking prescription blood thinners, Vitamin E or aspirin therapy must have their primary physician’s approval to stop these products approximately one week prior to treatment with Perma™Lip. New York plastic surgeon Dr. Zachary Gerut will apply an anesthetic cream to your lip area and leave it in place for about 30 minutes. Once it’s washed off, the area is then infiltrated with Lidocaine, which is a Novocain-type injectable to numb the lips completely. You may have a little bit of sedation if it makes you more comfortable and the procedure can be added to any general anesthesia facial procedure as well, such as a facelift, neck lift, etc. After making extremely small incisions at the corners of the lips, Dr. Gerut inserts the material with special forceps that he invented specifically for this procedure. Absorbable sutures are then inserted and ice packs applied. Recovery time is approximately 3-5 days, during which your lips will be a bit swollen. You may have some bruising, which can be covered with lipstick. Check out these beautiful lip augmentation before/after photos and call us for a consultation for a Perma™Lip procedure. 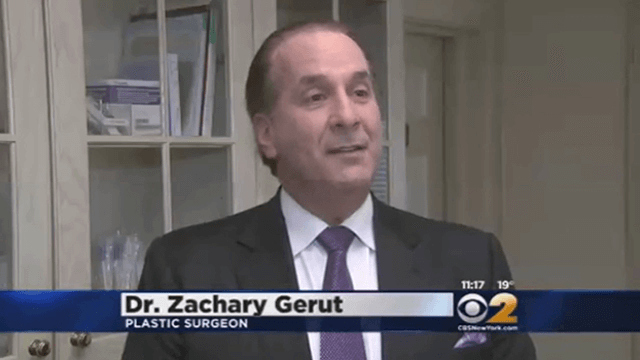 If you’d like a puckier pout, board certified New York plastic surgeon Dr. Gerut is here to help you. Call us at 516-295-2100 or complete our online consultation form to learn how you can get the lips you’ve always wanted! Take a look at some Lip Augmentation before and after photos from patients who were treated right here in our office! Hear directly from our Lip Augmentation patients in these video testimonials.